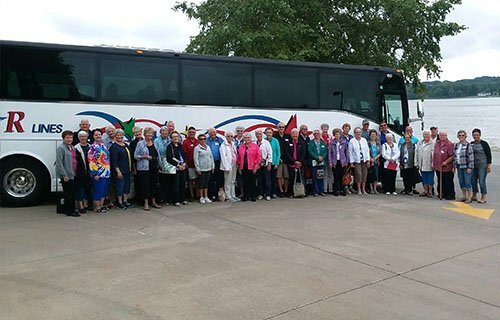 Windstar Lines' roots stem from a successful, Midwest-based tour operator in Carroll, Iowa. We know what it takes to provide the superior motorcoach rentals for tour operators. From the basics of good, reliable equipment to all the little “extras,” we’ve got you covered. An essential part of running a smooth tour program is ensuring your clients can get from Point A to Point B safely and in comfort and style. Our late-model equipment can transport any number of passengers to any destination in the continental U.S. and Canada! We offer luxury 21 Passenger Minibuses all the way up to our 56 Passenger Luxury Motorcoaches. All of our buses are equipped with a wide array of amenities. View our fleet to help decide which option will work best for your tour. Our drivers are not just hand-picked for their skillful driving; our drivers know how to provide unmatched customer service every step of the way! If your group is departing from, traveling through, or flying into any of our service areas, give us a call! We can’t wait to show you what a great motorcoach experience should be.